… but you can’t complain about the price when you do! Off out spending money in local shops again this afternoon – something I wouldn’t really bother with if I had to park the car, carry a ton of change for the meter and still get it wrong (somehow) and end up with a £60 fine. 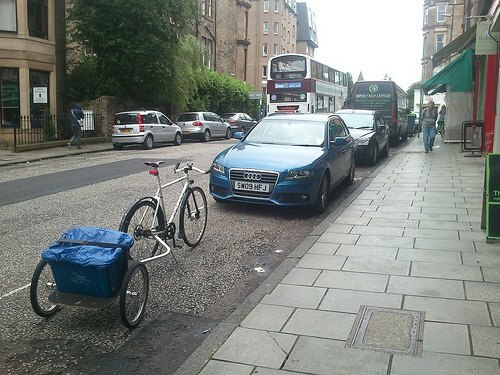 It’s really strange that local government and shopkeepers both seem convinced that Edinburgh’s life blood hinges on facilitating maximum motorcar throughput (often just people heading to the nearest retail park outside the bypass anyway) rather than making local journeys like this one simple and safe-feeling by bike. My record was 147kg of logs from Lochend woods – just over a mile home – easy does it!